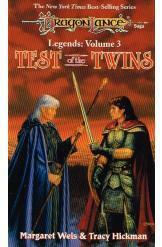 DragonLance: Test of the Twins by Margaret Weis and Tracy Hickman, Sci Fi. Book is in good condition, all pages intact. Raistlin casts a spell that opens a portal for him. At the same instant, Caramon is operating a magical time device. The magic goes wrong, and Caramon and Tasselhoff are flung into a different time and place where they make a horifying discovery. Meanwhile Raistlin enters the Abyss faced with a deadly challenge.